A beautiful Villa located on the luxurious development of Tuscan Hills. Superbly furnished to a very high standard, this mediterranean style villa will be ideal for a large family or 2 smaller families sharing, sleeping up to 10 people. 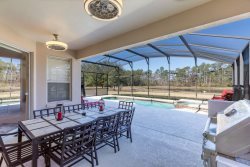 Located conveniently off Highway 27, Tusacn Hills is only 10 minutes drive to Disney World and within minutes of shops, restaurants and several golf courses. Tuscan Hills is a secure gated community with its own on site facilities which include a club house with gym, games room, tennis court, beach volleyball court, childrens play area and free internet access. The villa is south facing, enjoying the sun all day long. It also benefits from having air conditioning so will remain at a constant temperature for your comfort. The main living area's open plan design is spacious allowing everyone to remain connected whether in the formal dining area, breakfast bar area or living room. The large pool with its own built in spa is private and secluded and catches the sun all day. The large deck area is ideal for outside dining and barbeques. The pool and deck area can be lit for evening use. There are sun loungers and outdoor furniture. The living room opens out onto the pool/deck area and is furnished for comfort. There is a 40'' plasma TV with FREE cable TV, DVD, PS2 and Hi-Fi system to keep the children entertained. The house also has FREE internet WiFi across the whole property. The kitchen is equipped to prepare and serve a substantial family meal or simply use for breakfast and snacks. The spacious master suite has a king size bed, with it's own direct access to the pool area. The en suite has a large walk-in shower and separate bath. The second master suite has a queen sized bed, en suite with shower/bath unit. Bedrooms 3 & 4 are twin beds, sharing a bathroom conveniently located between the two. All bedrooms have TV/DVD combinations. There is a fully stocked linen cupboard, together with washing machine and tumble dryer. Disney World - 10 mins Sea World - 15 mins Universal Studios & Islands of Adventure - 20 mins Busch Gardens - 45 mins All local amenities such as shops, supermarkets, restaurants and golf course within 5 mins.